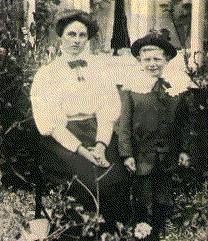 My grandmother with my father probably taken in Wantage around 1910. Mary was born in Letcombe Regis on 27 July 1880 and died in the John Radcliffe Hospital, Oxford on 6 February 1961. She was cremated at Headington, Oxford. Henry Hayden was born in Hatford, Berkshire 16 July 1850, son of Shadrach Hayden and Jane Neale He married Rebecca Thorn, b Langford 25 July 1850, daughter of Charles Thorn (decd) and Ann Clapton, on 10 October 1874 at Hatford. Charles Thorn b Shrivenham, Berks 1808, son of William Thorn and Sarah Bastin, married Ann Clapton at Hampnett, Glos on 20 Jan 1832. Henry and Rebecca lived at Letcombe Regis where Henry was a groom and had three children, Henry, George and Mary Jane, before Rebecca died in 1883. On 10th November 1883 Henry married his second cousin Mary Ann Varney at Letcombe Regis; by 1901 they were living in Broughton Gifford, Wiltshire. There were five more children - Mary Ellen, Emily Kate, Alfred Charles, Elsie Elizabeth and Florence. Mary Ann died in 1935 and Henry died, aged 85, in 1936. Shadrach Hayden, b Lyford, Berkshire 1828, son of John Hayden and Mary Cox married Jane Neale, born 1831 daughter of William Neale and Elizabeth, at Hatford Nov 13th 1849. They were still in Hatford in 1871 but by 1881 Shadrach was a shepherd at Pusey Lodge Farm, Pusey. By 1891 they had made their final move across the Thames to Bampton, Oxfordshire. Jane was buried at Bampton on 14th May 1910. Shadrach was buried at Bampton on 20th December 1916. Shepherd Shadrach Hayden was a traditional singer and was discovered by Cecil Sharp in 1909. He was also visited by the collector Alfred Williams. His songs appear in a number of compilations and have been recorded. Perhaps the best known is his version of John Barleycorn as recorded by Traffic.